He Got the Cover (Twice)! In honor of this week’s release of the annual Sports Illustrated Swimsuit edition, which includes Kate Upton as its cover model, I thought I’d share something I stumbled upon by pure coincidence a few weeks ago. As I sat in my recliner, the magazine rack next to me had a pair of hunting magazines resting next to each other. 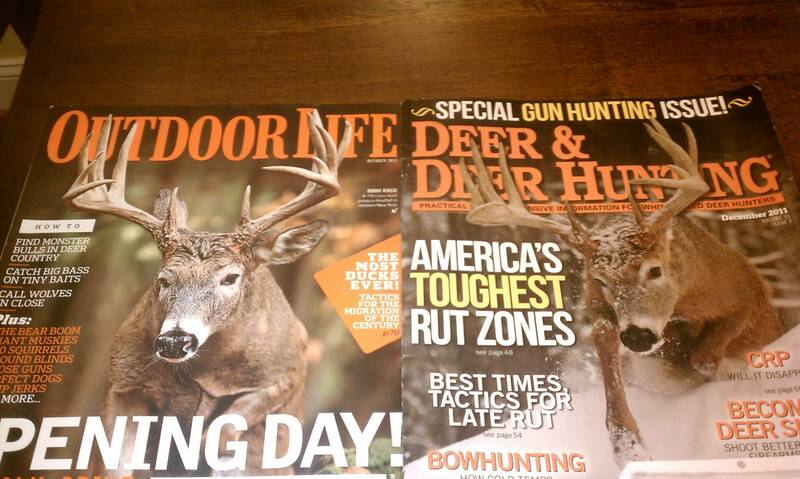 The magazines were the October Outdoor Life and December Deer & Deer Hunting. As I glanced at them, likely pondering if I should pick one up, I noticed how much alike the massive buck pictured on their respective front covers was. I realized that it was actually the same deer, in almost the exact pose, possibly over the same log, at a completely different time (the D&DH photo includes a snow-covered ground beneath the buck). And as I suspected, each cover was shot by renowned deer photographer (and fellow Southern Tier of New York native) Charlie Alsheimer. That buck has done well for Charlie! I’m really surprised that both photos ran so closely to each other (within a matter of a few weeks). I wonder if either publication had any issue with that. This entry was posted on Thursday, February 16th, 2012 at 10:05 pm	and tagged with Charles Alsheimer, Charlie Alsheimer, Deer & Deer Hunting, Kate Upton, Outdoor Life, Whitetails and posted in 2012, General Tales. You can follow any responses to this entry through the RSS 2.0 feed.